Amarin and Geron are two of the most popular stocks on the free stock-trading app Robinhood. One stock has quadrupled in value in recent weeks while the other has seen its shares crash. In both cases, millennial investors appear to be hoping more gains are in store. Follow Amarin and Geron in real time here. Every week, Business Insider analyses what investors on the free stock-trading app Robinhood are buying and selling with the hopes of finding something out of the ordinary. Usually any changes in the app’s Top-100 list are reflective of broader market movements – like the recent rally in weed stocks or chasing Nike’s gains after it premiered an ad starring the controversial football player Colin Kaepernick. But this week, two relatively obscure biotech names popped up on the list:Amarin and Geron. 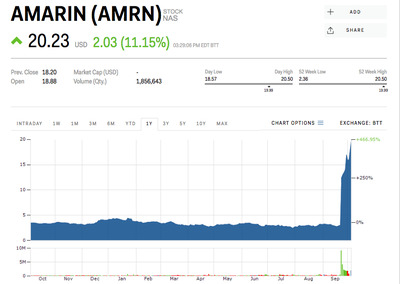 In the case of Amarin, shares of the biopharmaceutical company have quadrupled since its drug made from purified fish oil showed breakthrough results in a clinical trial on September 24. Not only did it reduce the risk of heart attack, stroke, and other catastrophic cardiovascular events by 25% in high-risk patients, it did so without side effects and is relatively cheap to produce. 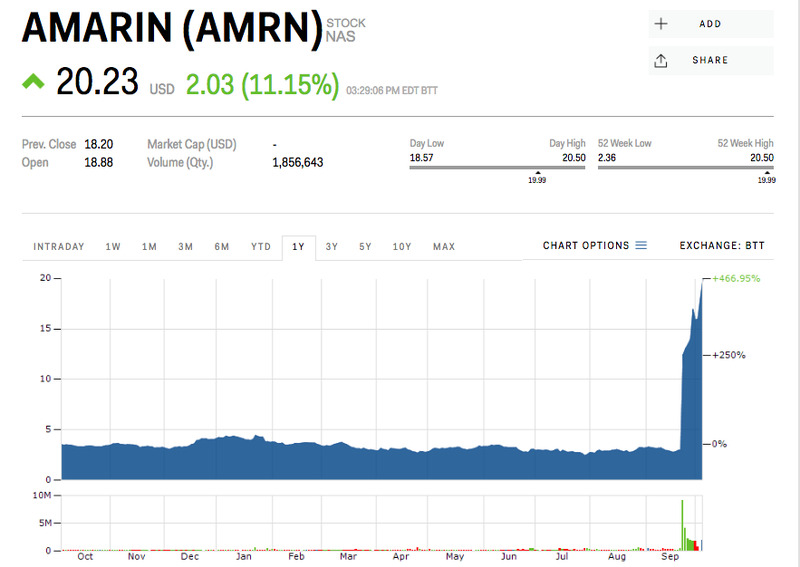 Amarin first popped up on Robinhood’s Top-100 list last week, with 11,000 of its users holding shares. It has continued to rise in popularity, with more than 17,000 users currently holding the stock. It’s now the 75th most popular. Still, Robinhood users appear to be hoping there’s an upside following the crash. Geron now owns all of the rights for the drug, but won’t receive more capital from Johnson & Johnson. Robinhood investors seem to be holding out hope that the drug will be approved. Of course, Geron will likely need the salesforce and expertise of a partner like Johnson & Johnson in order to actually make a profit from selling it. Before the massive rout, Geron saw an impressive 250% rise in its stock price. That climb helped it amass more than 30,000 investors on Robinhood, making it the 48th most-popular stock on the app.